I started training in Jiu Jitsu in 2004 at the University of Leicester. I achieved my 1st kyu (Brown Belt) in Seishin Mizu Ryu (SMR) in September 2007. In 2008 I started working in Sheffield and began training in Brazilian Jiu Jitsu (BJJ), which I did for consistently for about 16 months. 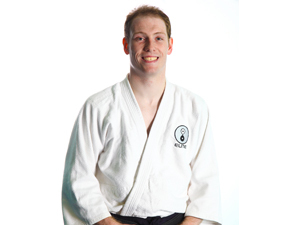 I returned to Leicester in April 2010 and began training and teaching at the Leicester Jiu Jitsu. I received my Shodan (Black Belt) in SMR on the 27 July 2010 and I am currently working toward the first part of Nidan. I like Jiu Jitsu for its technical elements which can constantly be improved and perfected and I feel this provides a longevity to enjoying training. My favourite aspects of Jiu Jitsu are striking, locking, throwing and ground fighting. I have a Level 3 BJJAGB Coaching Course certificate, Professional Indemnity Insurance from Sport England, an Enhanced CRB, a valid basic First Aid certificate and I also have full insurance within SMR to train, practice and teach.